KANNAPOLIS, North Carolina (Oct. 31, 2018) – Aric Almirola and the No. 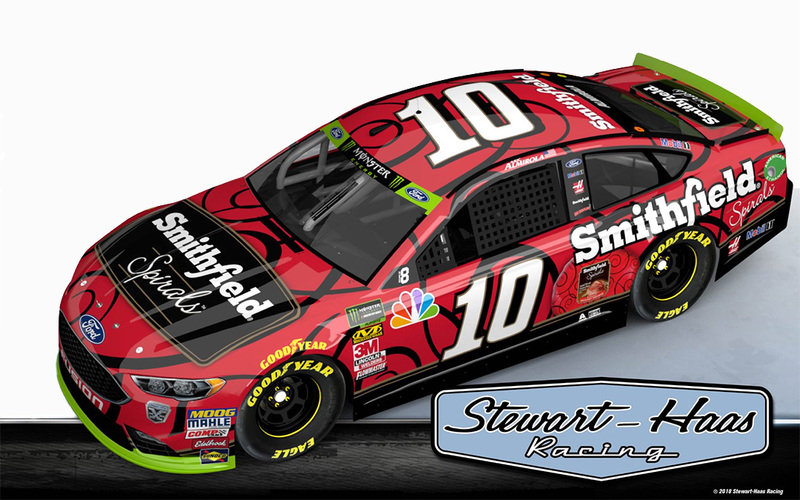 10 Smithfield Ford Fusion team for Stewart-Haas Racing (SHR) head to Texas Motor Speedway in Fort Worth for the 34th Monster Energy NASCAR Cup Series race this season. The event also marks the second race in the Round of 8 in the 2018 Cup Series playoffs. Almirola is coming off of an 11th-place finish Sunday at Martinsville (Va.) Speedway. ​Aric Almirola will make his 278th career Monster Energy NASCAR Cup Series start Sunday at Texas Motor Speedway in Fort Worth. The Smithfield driver will be made available to the media on Friday at 12:15 p.m. local time in the Texas media center deadline room. ​SHR occupies 50 percent of the playoff field. Almirola has has earned one top-10 finish in 15 Cup Series starts at Texas. Almirola drove the Bacon for Life Ford Fusion into victory lane at Talladega, but that doesn’t mean the promotion is over. One lucky person will win bacon for life by purchasing a specially marked package of bacon and entering the code on Smithfield.com/BaconForLife. The sweepstakes ends on Dec. 31.